Brookland is a neighborhood with strong connections to Howard and Catholic Universities, the Catholic Church, and Washington's black intelligentsia. Its rich past is well preserved in its architecture, historic sites, and social institutions. It is a thriving middle-class neighborhood and a place full of family stories. It is graced by beautiful institutional open spaces, woods, and large backyards. But above all, it is a place full of history. 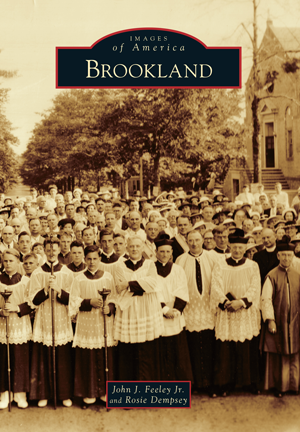 The Brooks Mansion, the Twelfth Street business corridor, the Franciscan monastery, Fort Bunker Hill, and the Ralph Bunche House—each site tells another story of Brookland. John J. Feeley Jr. is a Brookland native. He grew up roaming around Turkey Thicket, the woods of Sisters College, Fort Bunker Hill, and all the sites of old Brookland. When he took the 1965 Brookland tour, an insatiable interest in all things Brookland was sparked that has yet to be satisfied. Rosie Dempsey's Brookland roots date to her parents who met and married there. Rosie and her husband bought their c. 1896 home 25 years ago and joined numerous relatives in Brookland. The example of her cousin Helen D. Young inspired Dempsey to embrace civic life and neighborhood history.